I purchased this bowl at a yard sale and have no information about the history of it. 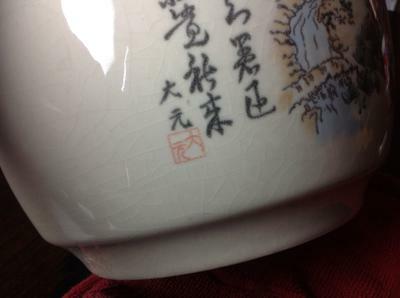 I searched some forums and Ebay to see if I could identify the writing on the bowl since there is no markings on the bottom of the bowl. The bowl does have some very small rust spots, glaze contractions, and it looks like some firing faults inside the bowl. 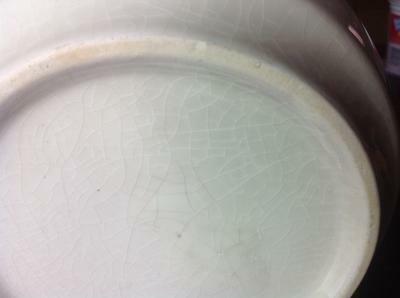 There is also a lot of discoloration under the glaze as well as crackling. I also would like to know the correct name for this bowl or vase. Once I learn about this bowl I will add it to my knowledge and share it with others. I am always buying vintage and antiques items which means that I am always striving to learn all that I can. I have used this website before and have an active item in the forum that I am still seeking information on. So if anyone can help me identify this bowl... I would appreciate it to the fullest. Not so sure what makes you think this is Chinese rather than Japanese. It appears more Japanese to me. have the black graphic linear outline of the river and mountain scene. Japanese art is always more graphic and less painterly 99% of the time. The calligraphy could be either, as Japan uses Chinese writing at the base of the language, in the same way as European languages use Latin. However the style of the calligraphy with the little red square seal stamp appears to be more Japan to my eye (may be wrong). The only word I can fully read is the 太 symbol meaning 'Great' (Dai) - which looks to me as if it might be Great Nippon (Great Japan) - which would be a commonly used phrase. But this is tentative as I don't know for sure as Nippon is written weirdly. Also, Chinese vases and bowls tend to adhere to more identifiable shape families. A simple bowl shape of this kind is not in any family of classic Chinese shapes I know of. Items with the words 'Dai Nippon' (Great Japan) continued at least until the 1930s according to Gotheborg - as identification markings on the base. The words other than the red square, may well be saying words of well wishing, such as happiness, good luck, harmonious relationships, prosperity, good fortune and wealth etc. Hope we can clarify this one pretty soon. 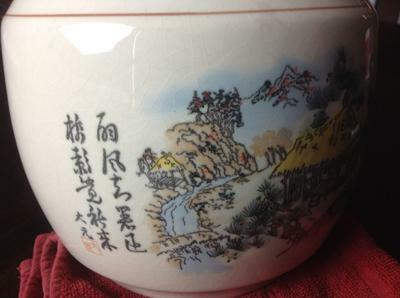 Comments for Can anyone help me identify this Chinese crackle bowl with mountain scenery and calligraphy please? I'm sorry, but not one picture shows the entire object, to rule out it being a ginger jar missing a lid, for example.